At the core of the Undanate kinetic sculpture is the module shown in this 8 frame loop: an offset circular cam lifting a free-pivoting arm. This module is repeated 24 times on each side, and this group creates the "undulating wing" form. Each iteration of the module is the same except that the cam is offset 22.5 degrees from the one before it. This offset gives 1.5 wave cycles in a 24 arm wing. The left and right cam-stacks rotate in opposite directions, creating mirrored wing waveforms. 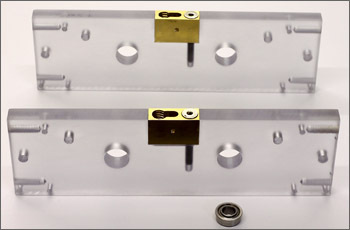 A pair of polycarbonate bulkheads (left) anchor the mechanical elements. The rotating cam stacks ride on 1/4" stainless steel shafts which are ball bearing mounted to the bulkheads. The arms ride on stationary 3/16" shafts. Brass power busses also are anchored into the bulheads. A maxon gearmotor (below to left) powers the camstacks via a right angle urethane round belt. Carefully calibrated brass counter weights (below to right) smooth-out the torque cycle, giving quiet, smooth operation. Each arm is a little project in itself with 3 machined parts, a precise solder join, a miniature epoxy casting and some tiny wiring which must withstand repetitive flexing. The lighting and skin of Undanate are designed to be interesting when the machine is viewed from a low angle in dim room light. The body envelope is made of lightly sanded clear polycarbonate. 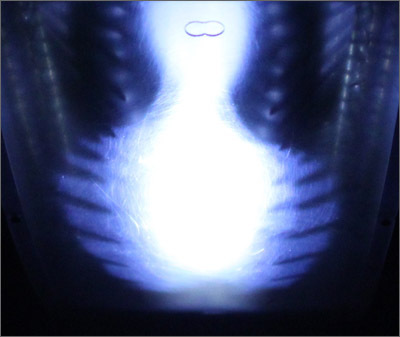 In addition to defining the body form, this material transmits a fairly clear image of internal mechanisms when directly overhead (left above). This sharp image dissolves into glowing blur and strange shadow effects as the machine recedes (right above). Internal white LEDs are positioned to best illuminate the cam stacks and introduce some flicker from the gear teeth. 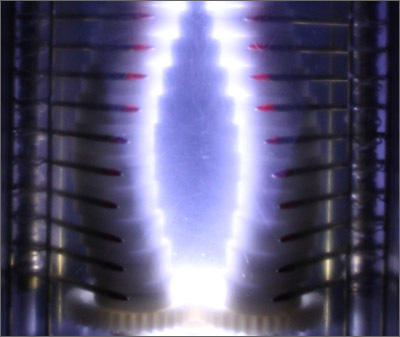 The 48 dim red LEDs on the arm tips help illustrate the waveform of the "wings".